In the vibrantly diversified Greater Los Angeles Area, the Taiwan Academy – Los Angeles serves as an exchange platform of Chinese culture in Taiwan, Republic of China. The Taiwan Academy – Los Angeles will engage with the global society to experience the profound Chinese culture with Taiwan’s distinctive characteristics through the three realms of “Taiwanese and Sinology studies”, “Taiwan’s culture multiplicity”, and “Chinese language teaching & learning”. remote-teaching technology and on-line Taiwan Academy website support. 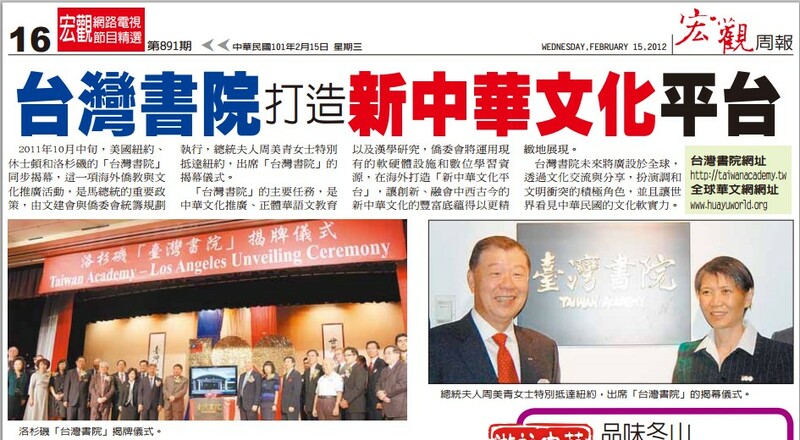 We hope through the fostering collaboration, the Taiwan Academy – Los Angeles will develop into a cultural platform of peace, friendship exchange and convergence of cultivated minds.